Like Brigadoon of yore, each year at the Indiana State Fair a magical thing happens. A wagon wheel shop appears on the fair grounds and for the next two weeks wheels of all sorts are repaired, mended, re-tyred and fixed. We come from Michigan, Kentucky and Indiana to practice and learn this craft. I have been involved with this group for over 10 years and each August I trek to Indianapolis. 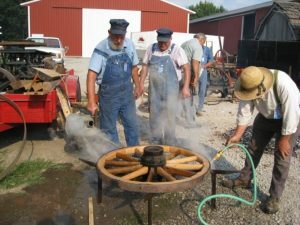 The Purdue agricultural alumni association sponsors and supports a museum on the state fair grounds. During the fair the museum becomes a living history show with a late 1800 – early 1900 theme. 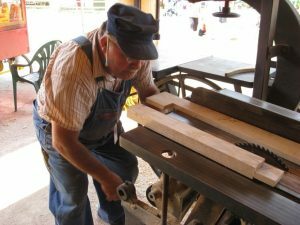 Musicians, wood carvers, quilters, blacksmiths and tractor collectors converge and share their interests. 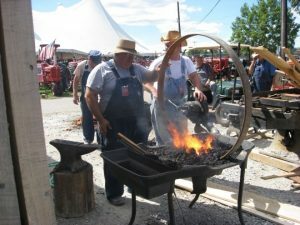 Did I mention they have wheelwrights there too. 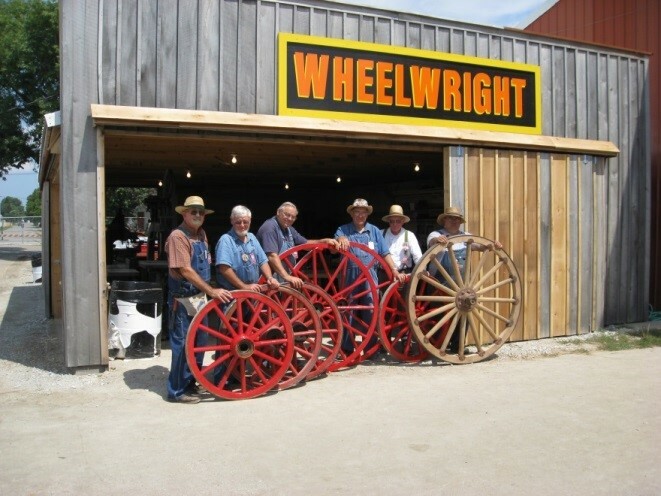 Seven wheels that we repaired. 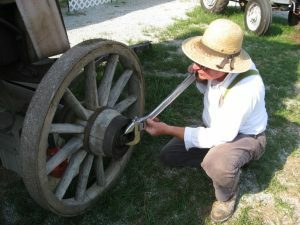 I’m holding the un-painted Spanish American War cannon wheel Each year we complete between 6-12 wheels. 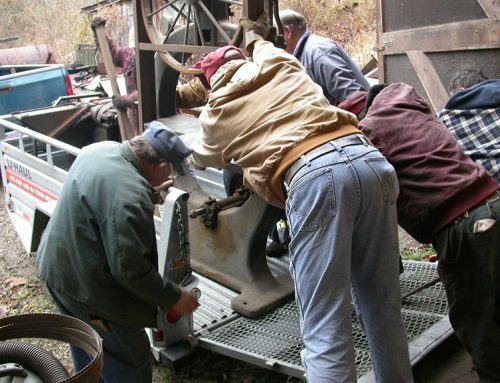 The wheels are usually from wagons and farm implements that belong to the museum. 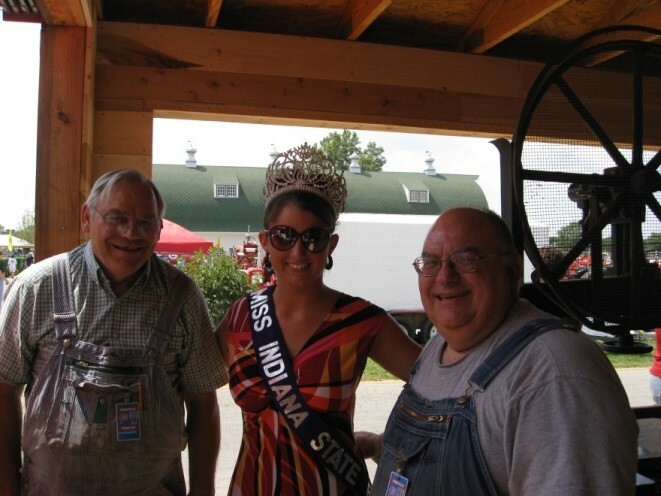 Each year the fair elects a queen from one of the counties in Indiana. Pictured here are Richard Cole, the state fair queen and I, hanging out in the wheelwright shop. Here Elsworth has selected the next victim for restoration. This wheel was rotten and the tyre was loose. The tyre will be cut off, bad spokes will be re-made, the wood rims will be replaced if required and the tyre re-welded to the correct size. The tyre is re-set by heating in a fire. Painting is the job most of us don’t like. Harley is getting ready to cut the taper on the new spokes using a cresent woodworking combination machine made in 1913. The spokes are usually made from white oak or ash. The tenon is cut on a tenoning jig using a parks wood working machine made in the 1920. The oval shape of the spokes is created on a shaper using an oversize roundover bit. 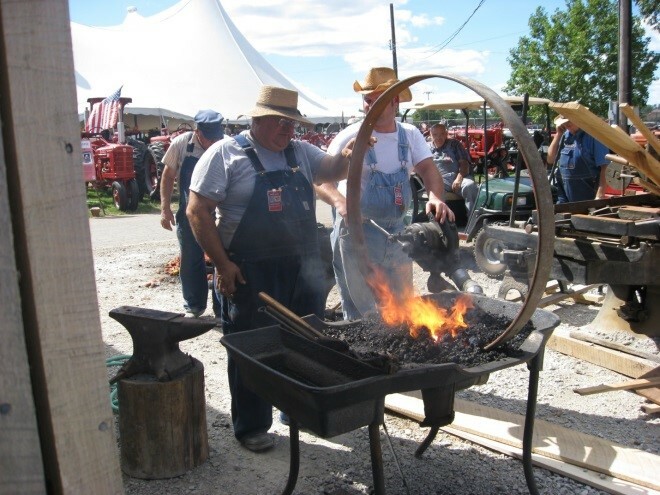 When everything is just the right size the tyre is heated until it is between 800-1000 degrees F. We use corn cobs at the fair because they are available from the farm demonstration area. They work great. 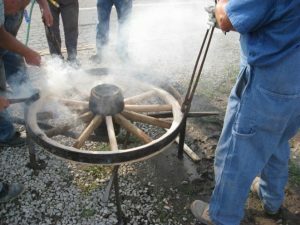 When the tyre is heated it is placed on the wooden wheel and immediately water is poured on the steel tyre to cool it before the hot metal burns the wood. There is always a lot of commotion, hammering, excitement and confusion at this moment. Between the smoke, steam and dangerously hot tyre the adrenaline is really pumping. Are we having fun yet?? 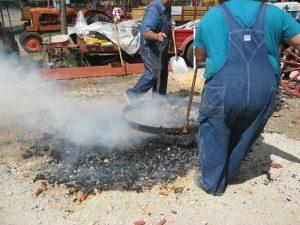 If you are ever in the Indianapolis area around fair time look me up in the Pioneer Village. I’ll be in the smoke and steam setting a tyre. But just like Brigadoon it only happens once in a while.